What? Me, cheesy? Photo by Lisa Rochford. Greetings! As you can see from my bibliography and IMDb pages, in the time since my first newspaper article was published in the 1980s, my writing career has traveled many avenues. I’m now primarily a prose fiction writer, preferring the genres of horror, fantasy, and science fiction. I also enjoy writing comedy and commentary. I live in Staunton, Virginia, with my wife, Deena Warner, and sons, Owen and Thomas. Deena and I are partners in Deena Warner Design LLC, a print and website design business catering to the publishing industry. Thanks for visiting. Please come back often! P.S. 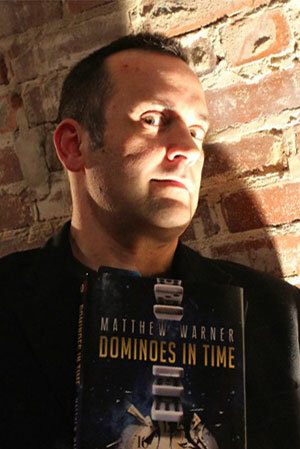 I’m not that Matthew Warner, in case you were wondering. Click here for another version of my bio.